The United States Lines' Washington was built by New York Shipbuilding Corp., of Camden, New Jersey, and was launched in 1933. She made her maiden voyage from New York to Hamburg on 10 May 1933. In 1940, after World War II began, she was switched to a New York-Genoa service which ended later that year. She then did some cruising before serving as a troop transport named Mount Vernon from 1941. Purchased by the US government in 1942, she was renamed Washington in 1945 and was handed over to the US Maritime Commission after the completion of her trooping duties. She returned to service on 2 April 1946, with a New York-Southampton sailing. 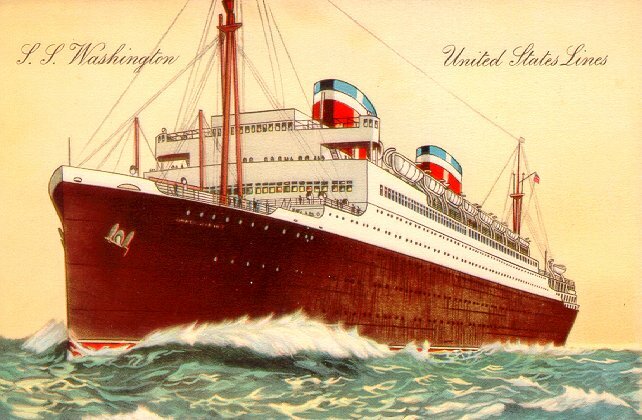 In 1948, Washington was chartered to her original owner, United State Lines, for service on her original route, New York-Hamburg. She made her commercial last voyage, from Southampton to New York, on 12 October 1951. She was then turned back to the Maritime Commission, which placed her on Military Sea Transportation Service duty through 1953. In February 1954, Washington was mothballed as part of the Hudson River reserve fleet, becoming the largest ship ever to travel up that river north of New York City. She remained there until she was broken up in Kearny, New Jersey, in 1965. Sources: The New York Times, 13 February; Kludas' Great Passenger Ships of the World; Bonsor's North Atlantic Seaway. Thanks to Karl Balys for his assistance.